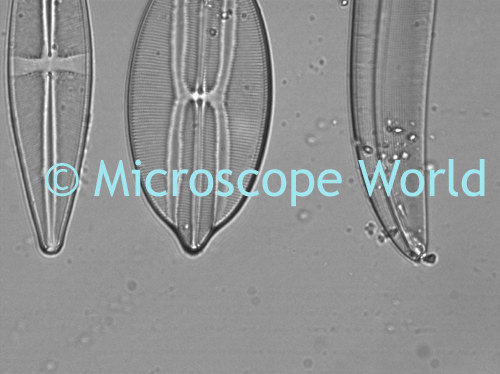 Microscope objective lenses, when clean, open up an entirely unseen world to the user. When dirty, the objective lenses on a microscope can obscure microscopic images and cause a great deal of frustration. This microscope image was captured at 40x and shows distracting dirt and debris. This would be considered a poor photo-micrograph. 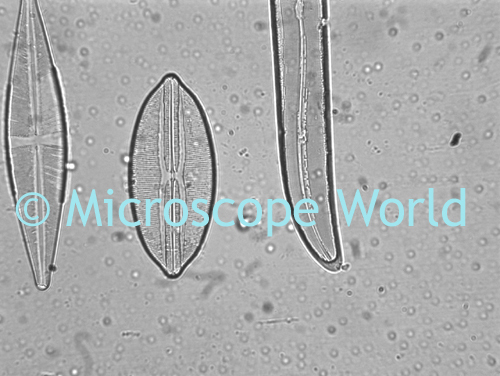 This is a much more clear microscope image that was taken after the objective lens was cleaned. There are several things you can do to keep your microscope clean and functioning properly. Cover the microscope with a dust cover when not in use. Clean the lenses after use, especially when using immersion oil. The best way to get dust off the optics is with an air puff blower, found along with other cleaning supplies in this microscope cleaning kit. Do not store your microscope in a hot and or humid environment. In other words - your garage or attic are not the best places to keep the microscope. Store the microscope in a case or cabinet when not in use. Not only will this help keep dust and debris off the optics, but it will protect the microscope from getting knocked off a shelf and becoming damaged.